Campers arrive between 9:00-9:15AM. Attendance is taken and camp is divided into their age groups. 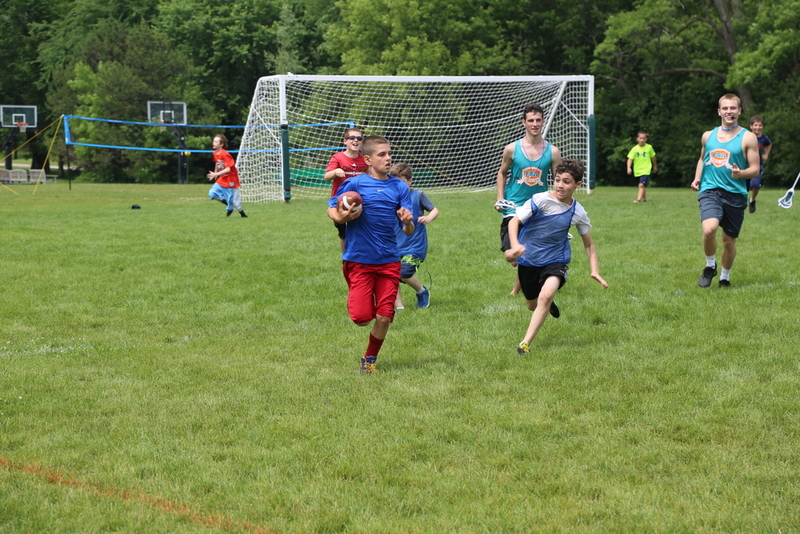 Campers will spend the first period with their entire age group, playing with their best friends, creating new friendships and building overall age group camaraderie. 1st-3rd Grades have an instructional period or a fun Schoolyard Sports game. 4th-6th Grades head to the fields for their first league game. FSA Sports Camp has fresh fruit delivered to camp weekly. Orange slices and watermelon are served daily to keep campers refreshed and primed for games, competition and fun! All campers will be playing a league game. The first two weeks of each session is League action for "Big" and "Small" Teams. Teams are created equally and conclude with playoffs and championship games. The third week of camp is "Rivalry Week," where campers represent a wide-range of well known rivals and compete only within their age division. Whether our youngest campers are dueling in the GaGa pit for a Pepsi vs. Coke showdown or our oldest campers are hitting the hockey rink in an Army vs. Navy matchup - "Rivalry Week" is the penultimate session challenge and showcases some of our camp's best cheers! The fourth and final week of each session is the Big Showdown - Tribal Takeover or Blue vs. Red! Camp is separated into Tribes or Colors, where each age division is represented and competes for points. Camaraderie, competitiveness, sportsmanship, fun and energy levels are at the highest of highs during the final week. 1st-3rd Grades will during this period. 4th-6th Grades will have open areas. Time to unwind! After a morning of sports, we cool down with "Open Areas." This is a time devoted to camper's personal preference. 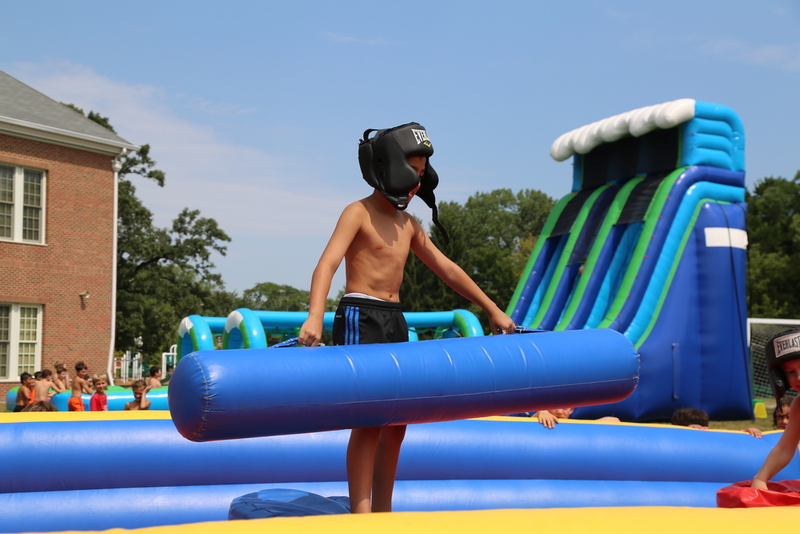 Each day, camper's nominate games or skill-stations they would like to participate in. Campers then have the option of joining the game or station of their choice. This is a great time for campers of all ages to create new friendships or bond with other counselors. Ok... we don't just eat oranges! We serve well-balanced, nutritious meals. You can either pack a lunch of opt-in for our hot lunches. A special way to end the day. We keep this part of the day a secret and announce the afternoon program (AP) to the camp just before we start. The AP consists of traditional overnight camp games like Capture the Flag, Pro's vs. Joe's, as well as many others. This portion of the day allows for kids of all different ages to be together, get to know one another, and build multi-generational friendships! FSA Sports Camp prides itself on creativity and thinking outside the box. Every Friday is a "Friday Fun-Day!" where our staff creates an entire day of new games, in addition to adaptations of some of our camper's favorite traditional camp games, to fit such themes as: Armed Forces Day, Halloween in July, Wild West and Amazing Race to name a few. Campers are sometimes placed on teams with only their age group or with kids of multiple age groups depending on the activities. Expect your camper to come home with exciting stories, face paint or a new hair color on these days! Wednesday's are "Trip Days" at FSA Sports Camp. We may go on an entire camp field trip or divide the camp in to multiple groups. Trips include Key Lime Cove Indoor Water Park, Dave and Busters, Brunswick Lanes, Lake Andrea, Ringside Sports, or other new exciting locations we may come up with. To create anticipation and excitement, field trip destinations are a surprise to campers and are announced the day before. Every camper will take a swim test administered by Foss Swim school, so we are aware of each camper's swim level prior to a water based trip. Field Trips depart mid-morning and campers return to camp camp just before 3:00 pm. Whether it's a Pajama Party, Hawaiian Luau a Video-Truck, or a Wrigley Rooftop - we always have a trick up our sleeve for extracurricular fun! Each age group will have one Undernighter or special trip per session. These social events occur after camp hours and are great bonding nights for individual age groups. All Undernighters & Special Trips are free of charge. We have heard from many campers these nights are some of the most memorable, so make sure to RSVP!